A robotic Chinese spacecraft named Chang’e 4 braked out of lunar orbit and slowed to a controlled touchdown on the far side of the moon Thursday, a first in the history of space exploration. The lander later deployed a small rover to explore the surrounding landscape. The spacecraft landed at 0226 GMT on Jan. 3 (9:26 p.m. EST on Jan. 2) in the 110-mile-wide (180-kilometer) Von Karman crater, located in the southern hemisphere on the back side of the moon. Chinese websites released several images captured during the lander’s descent, and then revealed several more pictures taken of the mission’s six-wheeled rover as it drove down a ramp and onto the lunar surface. But Chinese state television did not provide a live broadcast of the landing, and reporters and space enthusiasts were kept in the dark, waiting for basic updates released on Chinese Weibo social media accounts. Chinese media also released few updates on the mission since its Dec. 7 launch aboard a Long March 3B rocket. Finally, after Chinese officials confirmed a successful landing, the country’s television news networks trumpeted the achievement in a series of broadcasts and feature stories. The state-run Xinhua news agency said the Chang’e 4 mission arrived at the targeted landing site at 10:26 a.m. Beijing time Thursday. Overall, Chang’e 4 accomplished the 20th soft landing on the moon’s surface. A press release from the China Aerospace Science and Technology Corp., or CASC, the government-owned prime contractor for the country’s space programs, said the Chang’e 4 spacecraft fired its liquid-fueled variable-thrust engine beginning at 0215 GMT at an altitude of around 9 miles (15 kilometers) above the moon. The lander slowed its horizontal velocity from 3,800 mph (1.7 kilometers) per second to close to zero, then changed its orientation to begin a vertical descent before settling to a soft landing on four legs cushioned against the shock of touchdown. The far side of the moon is more rugged than the near side, so Chinese officials adjusted the descent trajectory for the Chang’e 4 mission to a more vertical profile from the curved profile used on Chang’e 3, China’s previous lunar lander which touched down on the near side in 2013. “We chose a vertical descent strategy to avoid the influence of the mountains on the flight track,” said Zhang He, executive director of the Chang’e 4 probe project from the China Academy of Space Technology, said in a report published by the Xinhua news agency. 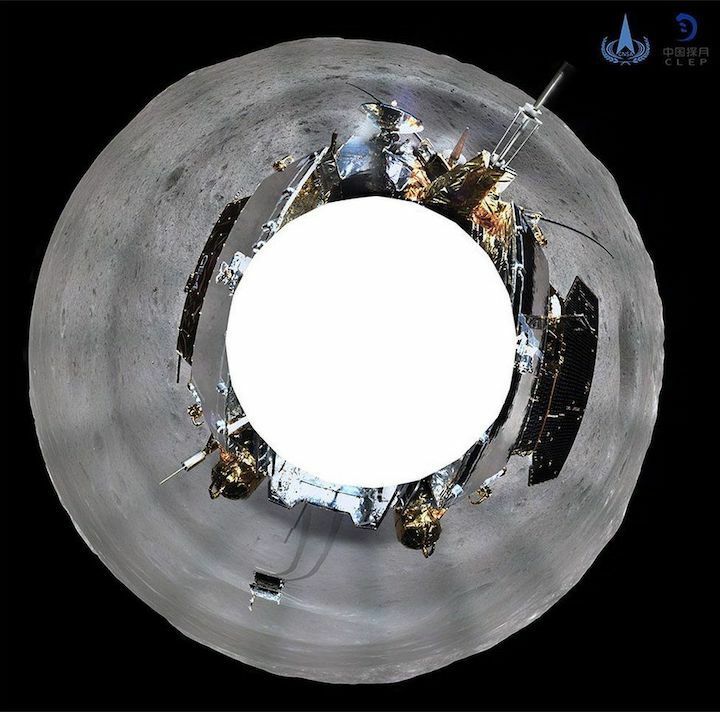 The Chang’e 4 spacecraft’s downward-facing camera took pictures of the landing zone from an altitude of around 6,500 feet — or 2 kilometers — to identify large obstacles such as boulders or craters. The lander paused its automated descent at around 330 feet (100 meters) in altitude to search for smaller obstacles and measure slopes on the surface, then used hazard avoidance algorithms to identify the safest place to set down, according to Xinhua. Chang’e 4 took the first picture from the surface of the far side of the moon at around 0340 GMT on Jan. 3 (10:40 p.m. EST on Jan. 2), showing a small crater in the foreground. The mission’s rover was named Yutu 2, after the mobile robot named Yutu that flew on the Chang’e 3 mission to the moon in 2013. Yutu means “jade rabbit” in Chinese, and is the name of the pet rabbit of the moon goddess Chang’e in Chinese folklore, the source of the name of China’s lunar missions. Chang’e 4 uses spare hardware built for the Chang’e 3 lunar lander and rover. The Yutu rover ceased driving a few weeks after landing, but some of the craft’s instruments continued to function for a couple of years, and the stationary lander — a carrier module that delivered the rover to the lunar surface — was still operating last year, according to an update issued by Chinese officials at the time. 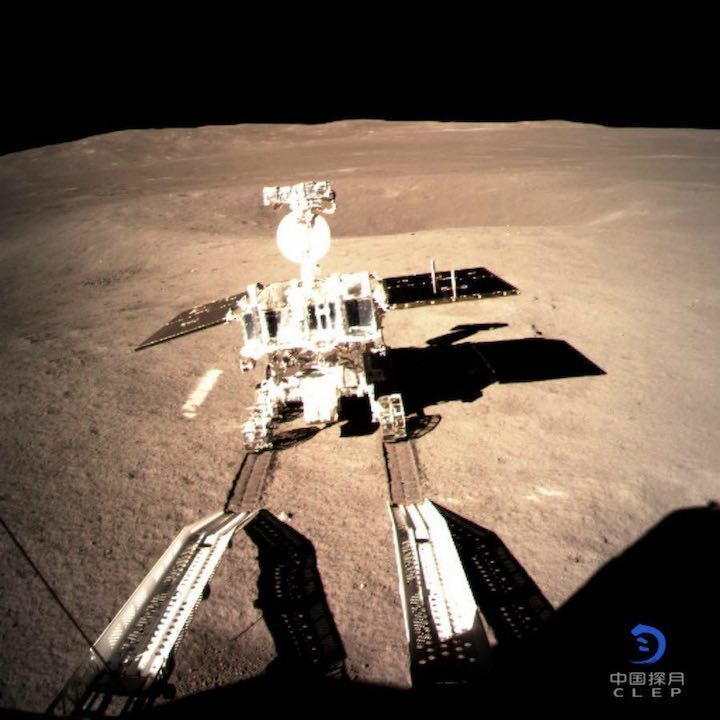 Chang’e 3’s Yutu rover was designed to drive up to 6 miles (10 kilometers), but it traveled only 374 feet (114 meters) before losing its mobility due to a hardware failure, according to Chinese scientists. The Yutu 2 rover is “lighter, smarter, stronger and more reliable” than is predecessor, Xinhua reported. “How to solve that problem so that it won’t happen again was the main challenge in developing the new rover,” said Zhang Yuhua, a deputy chief designer of the probe, in a story published by Xinhua. “We have improved the layout of the wires on the new rover and taken measures to prevent short circuits. We also made a fault isolation design so that if a problem occurs, it will not affect the whole system,” said Sun Zezhou, chief designer of the Chang’e 4 probe, according to Xinhua. The Yutu 2 rover disembarked from the Chang’e 4 lander at 1422 GMT (9:22 a.m. EST) on Jan. 3, according to CASC. There are some key differences between Chang’e 3 and Chang’e 4. For example, the Chang’e 4 mission does not carry a robotic arm or an Active Particle X-ray Spectrometer, an instrument capable to measuring the chemical elements in lunar rocks and soil. 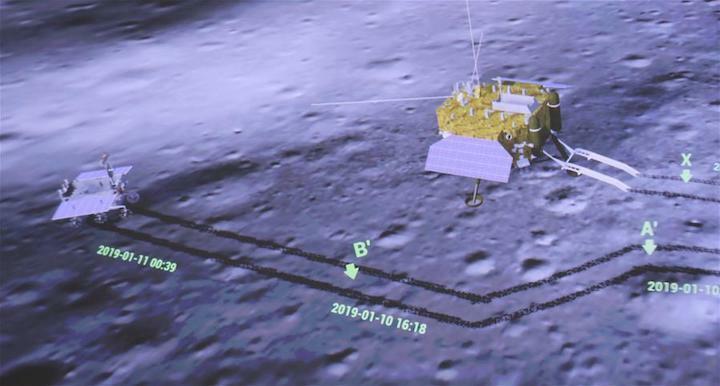 In addition to a suite of cameras on both the stationary lander and rover, the Chang’e 4 mission delivered a new set of sensors to the lunar surface, some of which are provided by European scientists. The roughly 2,600-pound (1,200-kilogram) landing module carries a low frequency radio spectrometer developed by Chinese scientists for astrophysics research. A German-developed neutron and dosimetry instrument on the stationary lander will measure radiation levels at the Chang’e 4 landing site, collecting data that could be useful in planning human exploration of the lunar far side, studying solar activity, and gauging the underground water content in Von Karman crater. Chang’e 4’s Yutu 2 rover weighs around 297 pounds (135 kilograms), around 4 pounds (2 kilograms) lighter than Chang’e 3’s Yutu rover. The lighter weight is primarily driven by the removal of the robotic arm, officials said. Yutu 2 hosts a ground-penetrating radar to study geologic layers buried under the landing site, and a visible and near-infrared spectrometer to gather data on soil composition. Chinese officials approved the addition of a Swedish instrument on the rover to study the interaction between the solar wind and the lunar surface, which is not shielded by an atmosphere from the bombardment of charged particles originating at the sun. Chang’e 4 also delivered to the moon a student-designed carrier containing potato seeds and silkworm eggs. University students and scientists will monitor the growth of the organisms, which are housed inside a chamber and fed natural light and nutrients once on the lunar surface. Jun said the experiment to place seeds and eggs on the lunar surface could also help engage public interest. Upgrades installed on the Chang’e 4 rover could allow it to reach the original design goal of Chang’e 3, which was to drive as far as 6 miles across the lunar surface, according to Jun. Xinhua reported the Yutu 2 rover has a design life of three months, and is capable of driving over rocks as high as 8 inches (20 centimeters). Its top speed is roughly one-tenth of a mile per hour (200 meters per hour), and the rover will hibernate during the 14-day-long lunar night, the first of which will begin in mid-January. 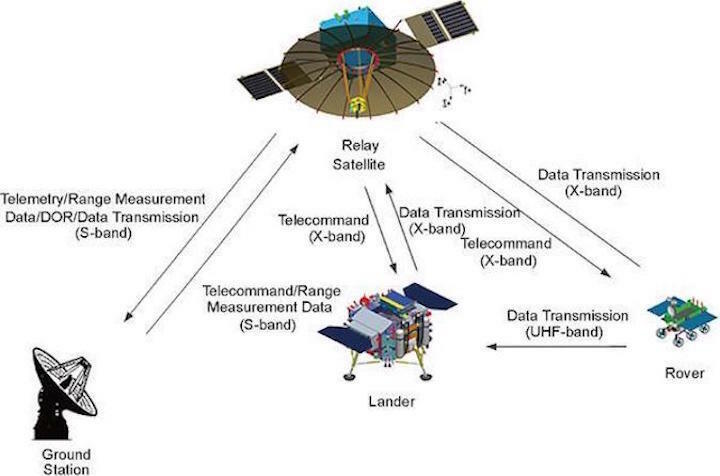 Payloads aboard Chang’e 4 include experiments developed by at Harbin Institute of Technology, Zhongshan University, and Chongqing University of Science and Technology, according to the China National Space Administration. 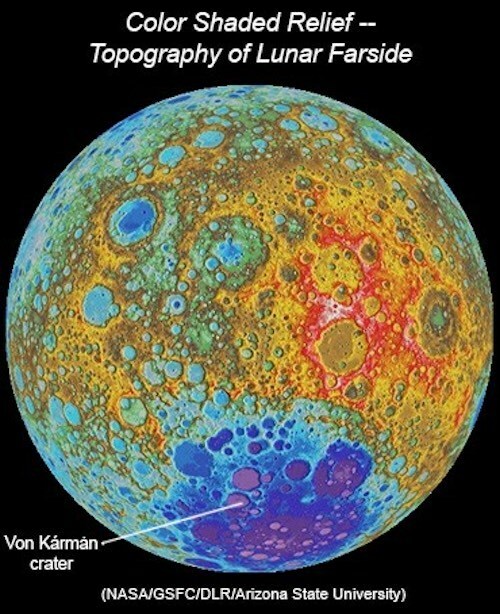 “The soft landing and exploration of the far side, which has never been done before, will gain first-hand information about the terrain and lunar soil components and other scientific data, which will help enrich our understanding of the moon and the universe,” said Zhang He, executive director of the Chang’e 4 probe project, in a report published by Xinhua. Chang’e 4’s landing site is located at 177.6 degrees east longitude and 45.5 degrees south latitude, officials said. Scientists believe the far side of the moon is covered with more ancient terrain than the near side, and U.S. teams have proposed for NASA to dispatch a robotic mission to a location in the South Pole-Aitken basin region — near Chang’e 4’s landing site — to scoop of samples and bring them back to Earth. The South Pole-Aitken basin region covers a large swath of the moon’s far side southern hemisphere, and is believed by scientists to be one of the most ancient impact sites in the solar system, created when a large asteroid or comet struck the moon. A sample return mission to the region could date the impact, and help scientists study how the Earth and moon were bombarded by smaller objects billions of years ago, said Bradley Jolliff, a geologist at Washington University in St. Louis who has proposed such a mission to NASA for funding through the space agency’s New Frontiers line of interplanetary missions. But NASA has not approved development of such a mission to the moon’s far side, and the only U.S. spacecraft currently exploring the moon is the Lunar Reconnaissance Orbiter, which has circled the moon since 2009. LRO is scheduled to fly over the Chang’e 4 landing site in late January, and its camera could be able to spot the lander on the surface. The first images of the moon’s far side were returned by the Soviet Union’s Luna 3 probe in 1959, and the first humans to see the far side were the Apollo 8 astronauts, which orbited the moon in December 1968. Jim Bridenstine, NASA’s administrator, tweeted his congratulations on China’s successful landing. “Congratulations to China’s Chang’e 4 team for what appears to be a successful landing on the far side of the moon. This is a first for humanity and an impressive accomplishment!” Bridenstine wrote. The moon is tidally locked with Earth, so the same side of the lunar surface always faces our planet. One of the critical challenges in sending a mission to the far side of the moon — the hemisphere that always faces away from Earth — is communications. China launched a dedicated relay satellite named Queqiao in May to pass off signals between ground controllers in China and the Chang’e 4 spacecraft when it is outside of direct radio contact. Queqiao, which means “magpie bridge” in Chinese, flew into a “halo orbit” around an Earth-moon gravitational balance location — called a Lagrange point — around 40,000 miles (65,000 kilometers) beyond the moon. At that location, the combined effect from gravity from Earth and the moon keeps Queqiao at roughly the same distance as the moon completes each 28-day orbit around our planet. Chang’e 4 is the final planned mission in the second phase of China’s lunar exploration program. China’s first lunar mission — Chang’e 1 — launched in 2007 and surveyed the moon from lunar orbit for more than a year before impacting the surface in 2009. The Chang’e 2 orbiter launched in 2010, explored the moon several months, then flew to a more distant libration point and escaped the Earth-moon system to fly by an asteroid in 2012, another first for China’s space program. Following the Chang’e 3 and Chang’e 4 lunar lander missions, China plans to launch the Chang’e 5 spacecraft in late 2019 to land on the near side of the moon, collect samples and return the specimens to Earth. The sample return mission would be the first to return material from the lunar surface to Earth since the Soviet Union’s Luna 24 mission in 1976. China launched a prototype re-entry capsule on a trajectory around the moon and back to Earth in 2014 to test the ship’s ability to withstand re-entry into the atmosphere on a return from deep space, which subjects the spacecraft to higher speeds and hotter temperatures than a re-entry from low Earth orbit. The Chang’e 5 T1 precursor mission was a success. A follow-up mission named Chang’e 6, using spare components from Chang’e 5, could attempt a sample return from the far side of the moon in the early 2020s, and China is developing long-range plans to send humans to the moon in the 2030s. China is also working on a Mars rover for launch in 2020. The inclusion of instruments on Chang’e 4 from Kiel University in Germany and the Swedish Institute of Space Physics marks the first time international payloads have flown to the lunar surface on a Chinese lander. China’s Queqiao data relay craft also carries an international science payload. Dutch scientists developed a low-frequency radio receiving flying on Queqiao to study how future missions heading to the far side of the moon could be used for astronomical observations, taking advantage of a “radio quiet” interference-free zone where the moon blocks natural and human-made radio emissions from the sun and Earth. Two tech demo microsatellites also launched with Queqiao earlier this year, each with their own radio astronomy payloads and optical cameras from Saudi Arabia. One of the small spacecraft reportedly failed to enter lunar orbit, but the other successfully arrived at the moon and beamed imagery back to Earth. Zhang Kejian, head of the China National Space Administration, or CNSA, said in October that the Queqiao relay satellite could be used by future lunar missions by other countries to the moon’s far side. Zhang also announced at the International Astronautical Congress in Bremen, Germany, that an extra 22 pounds, or 10 kilograms, of payload capacity will be available on the Chang’e 6 mission for small instruments provided by institutions outside China. There will also be opportunities for international science experiments on China’s space station, scheduled to be completed in 2022, Zhang said. While space agencies in Europe are looking to expand partnerships with China’s space program, NASA is banned by law from bilateral cooperation with China in space exploration. A provision inserted by former Rep. Frank Wolf, R-Virginia, in a NASA funding act in 2011 — and still in effect — prohibits the space agency from most forms of collaboration with China, such as direct agreements to support missions led by each nation. At the same space industry meeting in Bremen, the head of NASA said he is concerned about China’s military space efforts, but added that the space agency is open to expanded cooperation with the Chinese space program. Data-sharing between U.S. and Chinese scientists continues, and some non-governmental institutions have arranged technical dialogs and data exchanges between top researchers working on NASA and Chinese space missions. Bridenstine also emphasized the importance for all space powers, including China, to work together on limiting space debris in Earth orbit, and ensuring satellites do not collide or interfere with each other in space. China's Chang'e-4 probe has started the exploration on the far side of the moon thanks to the relay satellite that provides a communication link with ground control. The relay satellite, named Queqiao, meaning Magpie Bridge, after a Chinese legend, was launched on May 21, 2018, and became the first communication satellite operating in the halo orbit around the second Lagrangian (L2) point of the earth-moon system, nearly 500,000 km from the earth. The maximum distance between the satellite and the Chang'e-4 probe on the far side of the moon is 79,000 km. The satellite processes data from the probe and transmits it to earth, said Sun Ji, a designer of the satellite from the China Academy of Space Technology. The satellite can stay in its orbit for a long time due to its relatively low fuel consumption, as the earth's and moon's gravity balances its orbital motion, said Zhang Lihua, chief designer of the satellite. While in orbit, it can "see" both the earth and the far side of the moon. From earth, the orbit looks like a halo on the moon, said Zhang. The concept of deploying a relay satellite in the halo orbit was first put forward by U.S. space experts in the 1960s, but was realized by Chinese space engineers. "We will let Queqiao work as long as possible. It could also provide communication for probes from other countries if they intend to explore the moon's far side within the lifetime of the satellite," said Ye Peijian, an academician of the Chinese Academy of Sciences and a senior space expert. "And that will be a Chinese contribution made to the world," Ye said. The relay satellite will also be used for scientific and technological experiments. It has a low-frequency radio spectrometer, jointly developed by Dutch and Chinese scientists, to help astronomers "listen" to the deeper reaches of the cosmos. It also carries a reflector developed by the Sun Yat-sen University, in south China's Guangdong Province, to conduct the world's longest laser-ranging test between the satellite and an observatory on the ground. Researchers hope to use the cameras on the satellite to capture asteroids hitting the far side of the moon, said Sun Ji. "It's extremely difficult, but we hope to try," Sun said. To control the cost of the Chang'e-4 mission, the relay satellite was designed to be relatively small, weighing about 400 kg. Chinese experts designed several antennas for it, including one shaped like an umbrella with a diameter of almost 5 meters. "We learned from textile technologists and watchmakers in the development of the metal mesh and ribs on the antenna," Zhang said. "It must endure temperature changes of more than 300 degrees centigrade. We conducted countless experiments for that." His team had just 30 months to develop the satellite, putting them under tremendous pressure. To promote public interest in space exploration, the China National Space Administration invited people to write down their wishes for lunar and space exploration, and the relay satellite carries the names of tens of thousands of participants and their messages. On January 3, 03:26 Swedish time, the Chinese Chang'E-4 spacecraft landed successfully on the far side of the Moon. 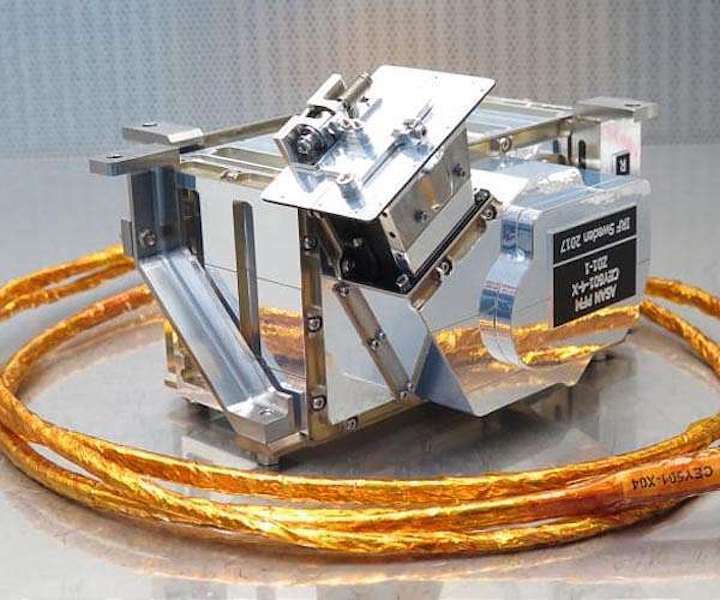 The Swedish Institute of Space Physics (IRF) has developed one of the scientific instruments on board. The aim of the instrument is to study how the solar wind interacts with the lunar surface. The Advanced Small Analyzer for Neutrals (ASAN) instrument was developed by the Swedish Institute of Space Physics in Kiruna - in collaboration with the Chinese National Space Science Center (NSSC). The instrument investigates how the solar wind, a flow of charged particles from the Sun, interacts with the lunar surface. ASAN is mounted on the rover of Chang'E-4, which makes it possible to perform measurements at different locations. The measurements could shed light on the processes responsible for the formation of water on the Moon. "The successful landing means that Sweden is back on the Moon and this is exciting. The next step for ASAN is the instrument commissioning. The first science data are expected before February, 11th," says Martin Wieser, researcher at the Swedish Institute of Space Physics and principal investigator of ASAN. 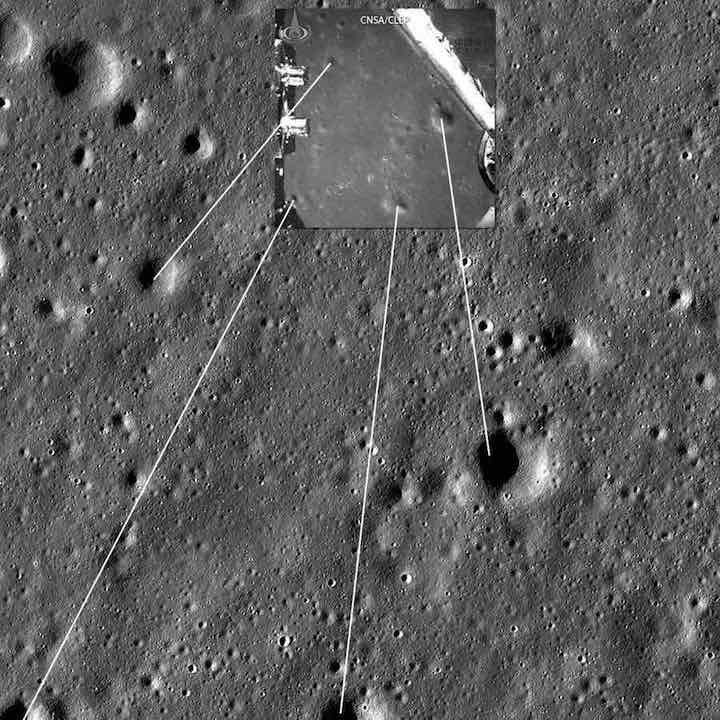 Landing on the lunar far side is complex as the landing site is not visible from Earth. To communicate with the lander, the Chinese National Space Agency (CSNA) has previously launched the Queqiao communication relay satellite into a halo orbit about 65,000 km further out than the Moon. Even after the landing there are challenges for Chang'E-4. The rover needs solar power to operate. After sunset, this power source is not available and the temperatures will drop significantly during the two-week-long lunar night. "The lunar night is especially difficult, but both the rover and our instrument are designed to withstand these extreme conditions. ASAN is mounted inside a thermally insulated payload compartment that is open during daytime and closed during night time to cope with the low temperatures. We keep our fingers crossed that all systems will work as designed," says Martin Wieser. 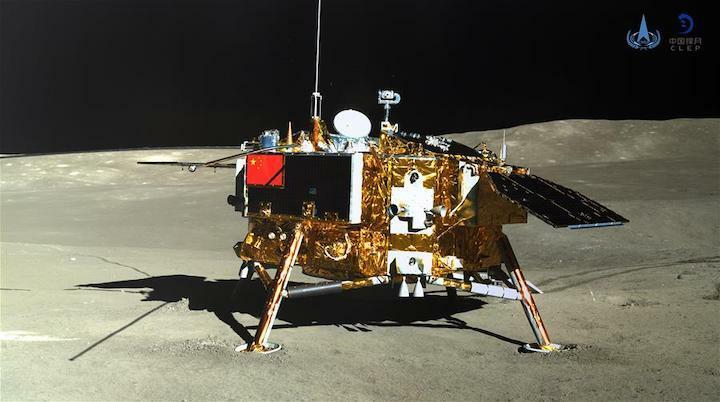 HELSINKI — China’s Chang’e-4 lander and Yutu-2 rover have tested out payloads and systems on the far side of the moon, with the rover now taking a ‘noon nap’ as a precaution against high temperatures. The Chang’e-4 lander made its historic landing at 177.6 degrees east longitude and 45.5 degrees south within Von Kármán crater within the South Pole-Aitken basin at 9:26 p.m. Eastern Jan. 2, following two weeks in lunar orbit. The rover was deployed from the lander just under 12 hours later, at 9:22 a.m. Eastern Jan. 3. 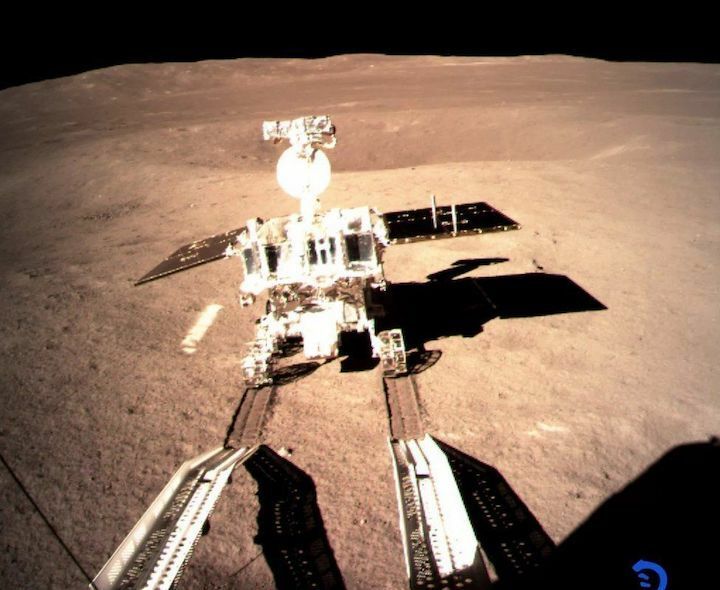 The rover also officially received the name Yutu-2 (‘Jade Rabbit-2’), following on from China’s first lunar rover for the 2013 Chang’e-3 mission. Monitoring cameras on the lander imaged the rover wheels during deployment and the craft on the surface, with the images returned to Earth via the Queqiao relay satellite stationed in a halo orbit around the second Earth-moon Lagrange point. After reaching a predetermined point, the Yutu-2 rover has entered a standby mode to protect itself from temperatures reaching toward 200 degrees Celsius the China Lunar Exploration Program under the China National Space Administration (CNSA) announced. The 140-kilogram rover, which has six drivable wheels with four, at the front and back, steerable to allow for pivoting, will resume activities Jan. 10 Beijing time. Zhang Yuhua, deputy chief commander and designer of the mission, told Chinese state media that next up for the rover will be to travel to the front side of the lander and image the craft. “After that, the rover will go to its planned area and start a series of scientific exploration projects in the Von Kármán crater as planned by scientists,” Zhang said. 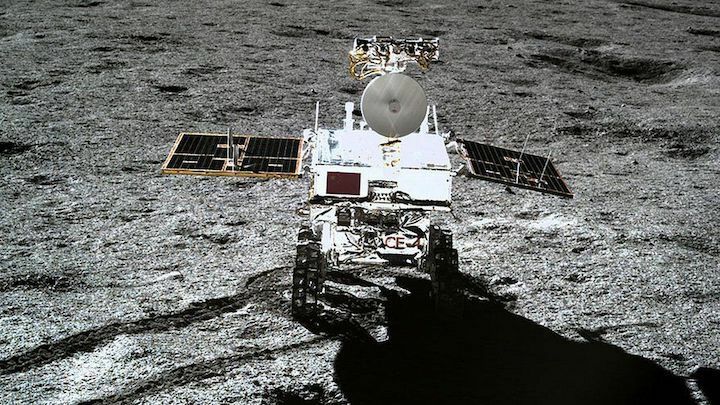 Shen Zhenrong, design director of the Yutu-2 rover, told China Central Television that the team adopted a new method to enclose Chang’e-4’s cables because the harsh lunar surface, citing rock edges that scratch cables and trigger short circuits. The Chang’e-3 Yutu rover traveled just 114 meters before becoming immobilized during is second lunar daytime on Mare Imbrium on the near side of the moon in early 2014. Jade Rabbit was the companion to the lunar Goddess Chang’e from Chinese mythology, for which China’s robotic lunar exploration is named. Preparations for entering a dormant state for the lunar nighttime to take place Jan. 12, when temperatures may drop to around -180 degrees Celsius. During this time, the lander — which has a small radioisotope thermoelectric generator — will be capable of limited functions. Since touching down, both spacecraft have been testing the science payloads and communications and optical systems. On the lander, the three 5-meter antennas of the low-frequency spectrometer for pioneering astronomy have been deployed, which will be visible in future Yutu-2 images of the front of the lander. The lander’s topography camera has also been tested and transmitted images back to Earth. The Yutu-2 rover’s panchromatic camera and lunar penetrating radar, payloads aboard the first Yutu rover with the Chang’e-3 mission, have also been tested. Robert F. Wimmer-Schweingruber of the University of Kiel, Germany, which developed the Lunar Lander Neutrons and Dosimetry (LND) experiment on the lander, told SpaceNews that the instrument had been turned on before descent from the lander and again tested after deployment of the rover. “As we understand, LND is healthy and working nominally,” Wimmer-Schweingruber said. LND will seek to understand the radiation to which lunar soils and rocks are exposed in preparation for potential human exploration, as well as detect sub-surface water. China's Chang'e-4 probe has started carrying out a series of scientific research tasks involving multiple countries and organizations since it landed on the far side of the moon on Jan. 3, the China National Space Administration (CNSA) announced Thursday. The probe, comprising a lander and a rover, was launched on Dec. 8, 2018. The Yutu-2 rover left its first trace on the far side of the moon late at night on Jan. 3, after it separated from the lander smoothly. A neutron radiation detector aboard the lander, developed by Germany, and a neutral atom detector on the rover, developed by Sweden, have both switched on for test operations, according to a CNSA statement. Their data will be transmitted to the ground via the relay satellite Queqiao (Magpie Bridge), which was launched in May 2018 to set up the communication link between Earth and the moon's far side, and jointly studied by Chinese and foreign scientists, it said. The Chang'e-4 mission, including the probe, Queqiao and a micro satellite orbiting the moon, is equipped with four payloads developed through international cooperation, providing more opportunities to the world's scientists and combining human expertise in space exploration. Queqiao carries a low-frequency radio astronomical instrument developed by the Netherlands, and the radioisotope heat source, a collaboration between Chinese and Russian scientists, will support the probe through the lunar night, each equivalent to about 14 days on Earth, when the temperature can fall to minus 180 degrees Celsius. The ground station that China built in Argentina has played an important role in the monitoring and control of the mission, and ground stations run by the European Space Agency will also offer support. A micro-imaging camera by Saudi Arabia aboard the micro satellite, which was launched together with Queqiao, is orbiting the moon and has sent back a photo in June 2018, capturing Earth and the moon together. 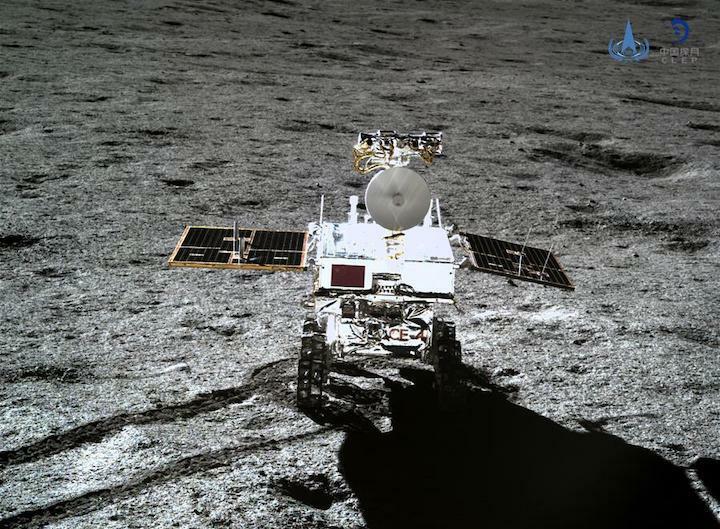 With the assistance of the relay satellite Queqiao (Magpie Bridge), the rover Yutu-2 (Jade Rabbit-2) and the lander of the Chang'e-4 probe took photos of each other. The scientific instruments aboard the probe worked well, and the images taken by the probe and detection data have been sent back to ground control, said the China National Space Administration (CNSA). At 4:47 p.m. Beijing Time on Friday, the images of the lander and rover appeared on a large screen at the Beijing Aerospace Control Center, showing the Chinese national flag on both the lander and the rover with the desolate landscape dotted with craters on the far side of the moon in the background. 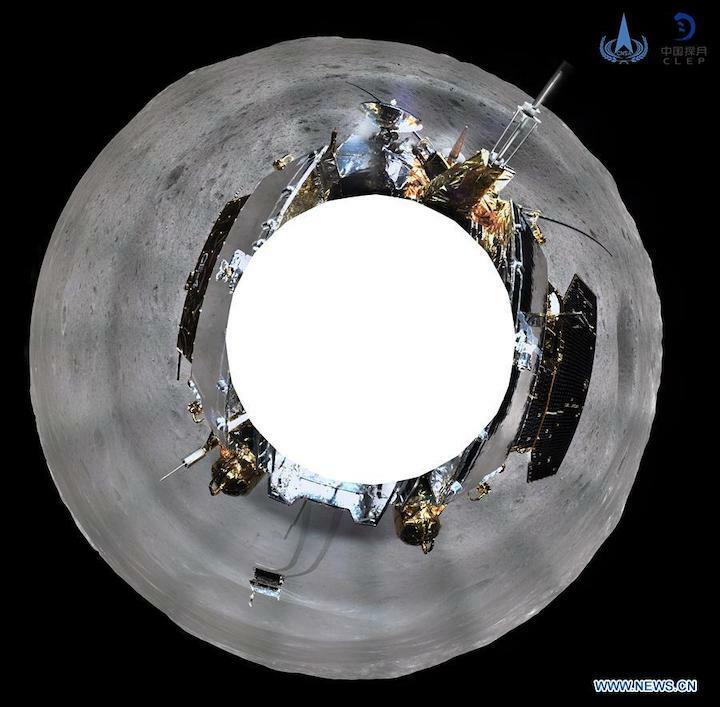 One of the images published by CNSA earlier on Friday is a 360-degree panorama which was pieced together from 80 photos taken by a camera on the lander after the rover drove onto the lunar surface, according to Li Chunlai, deputy director of the National Astronomical Observatories of China and commander-in-chief of the ground application system of Chang'e-4. "From the panorama, we can see the probe is surrounded by many small craters, which was really thrilling," said Li. Scientists have made an analysis of the terrain and landforms in the probe's landing area and planned a route for the future exploration of the rover according to the images taken by the probe. The Chang'e-4 probe touched down at the preselected landing area at 177.6 degrees east longitude and 45.5 degrees south latitude in the Von Karman Crater in the South Pole-Aitken (SPA) Basin on the far side of the moon on Jan. 3, with the rover driving onto the lunar surface late that night. Then the rover took a "nap" as the solar radiation raised the temperature on the lunar surface to over 100 degrees centigrade. It restarted its work on Thursday. The lander, the rover and the relay satellite are in good condition. After the lander and the rover photographing each other, the probe will start scientific detection, said CNSA. Named after Chinese moon goddess "Chang'e," China's lunar exploration program, which began in 2004, includes orbiting and landing on the moon and bringing samples back to Earth. The program has achieved five continuous successes, said CNSA, referring to Chang'e-1, Chang'e-2, Chang'e-3, a test craft for Chang'e-5 and Chang'e-4. Chang'e-4 is carrying four payloads developed by the Netherlands, Germany, Sweden and the Saudi Arabia. "International cooperation is the future of lunar exploration. The participating countries would share the costs, risks and achievements, and learn from each other. We hope to have more international cooperation," said Wu Weiren, chief designer of China's lunar exploration program. A neutron radiation detector aboard the lander, developed by Germany, and a neutral atom detector on the rover, developed by Sweden, have both switched on for test operations, said the China National Space Administration (CNSA) on Thursday. The radioisotope heat source, a collaboration between Chinese and Russian scientists, will support the probe through the lunar night, each equivalent to about 14 days on the earth, when the temperature can fall to minus 180 degrees Celsius. The scientists of the Lunar Reconnaissance Orbiter (LRO) of NASA have also cooperated with the team of the Chang'e-4 mission to study the landing of the Chang'e-4 probe, according to CNSA. The U.S. side has offered the orbital data of LRO and the Chinese side has provided the landing timing and location, said CNSA. China was drawing up the plan for the fourth phase of the lunar exploration program, and more payloads of future missions would be developed through international cooperation, Wu said. "The range of cooperation will be enlarged. Maybe the whole lunar rover could be developed through international cooperation," Wu said. "The cooperation on the four payloads in the Chang'e-4 mission was smooth. We made all efforts to create favorable conditions for our partners," said Sun Zezhou, chief designer of the Chang'e-4 probe. "It's our common goal to improve human understanding of the moon and the universe. The collaboration will benefit all participants," Sun said. Ping Jinsong, a researcher with the National Astronomical Observatories of China, cooperated with Dutch scientists on the low-frequency radio detector on the Queqiao relay satellite. He said scientists from both countries overcame difficulties in language, culture, law and habits, and accumulated much experience through cooperation. Johan Koehler, head of Solar System Science and Space Situational Awareness at the Swedish National Space Agency, said no measurement had ever been done of the far side of the moon. "It is a great achievement by China, and we are very happy to be a part of it. "Our payload on the rover will measure the interaction of the solar wind with the lunar surface. It's very important to understand what happens when the solar wind crashes into the lunar surface," said Koehler. He said the solar wind interacts with the lunar surface and disperses particles that form the extremely thin atmosphere-like gaseous environment of the moon surface. "This is the environment that we know very, very little about, and it's very important to extend humanity's knowledge of the solar system. "There is a theory that water on the surface of the moon is formed by the interaction of the solar wind with the surface regolith. So this is something that the Swedish scientists together with the Chinese scientists want to answer," Koehler said. "Right now China is the only country that has an active lunar program. It's a great opportunity. This particular instrument we have been developing since 2015, and before that we had much fruitful collaboration with China in space science." Professor Robert Wimmer-Schweingruber, of the Institute of Experimental and Applied Physics at Kiel University, Germany, participated in the development of the neutron radiation detector, installed on the lander of Chang'e-4. "Our instrument measures the dose rate of the radiation which astronauts would experience on the moon. And that's something important because once astronauts come back from the moon, that's the only risk that remains," he said. The instrument also measures thermal neutrons, which may help detect subsurface water. It was the first such instrument operating on the moon. "This mission is very exciting. Preparing for future human exploration of the moon is an excellent idea," he said. "We worked with Chinese scientists for about two years on Chang'e-4. Chinese scientists are excellent. We wouldn't have managed to build our instrument without Chinese help," he said. "I think one of the beauties of space science is that we do cooperate internationally. Space science to me is something important, also as a message of peace worldwide." China has released amazing footage of the descent of the Chang'e-4 spacecraft which shows the historic moment of the first landing on the far side of the Moon. The Chang'e-4 spacecraft touched down on the far side of the Moon, which never faces the Earth, at 02:26 UTC on January 3, deploying the Yutu-2 rover 12 hours later, but this is the first full footage we've seen of the landing. The footage comes from the descent camera which initially gives a view ahead of Chang'e-4 over the 186-km-diameter Von Kármán crater, which contains the preselected landing site. The video shows how, as the craft descends, it is extremely difficult to visually gain any sense of distance to the surface before the landing. At around one minute into the footage we see the spacecraft rotate 90 degrees following the main deceleration phase of the descent, to give a vertical view onto the lunar surface. At this point Chang'e-4 should be around 6 kilometres above the Moon, with the lander receiving distance and velocity data from its laser range sensor. During this approach phase Chang'e-4 makes a number of manoeuvres as part of coarse hazard avoidance based on optical imaging, all of which are automated processes. At around 100 metres 3D laser scanning imaging provided elevation data, as illustrated in the animation above, as part of a hovering phase which allowed for avoidance of hazards on the surface which could have threatened the landing. Just after two minutes we see the final descent onto Von Kármán crater and the exhaust from the main engine interacting with the surface. Also on Friday China released the first panoramas from the lander's Terrain Camera (TCAM), with this 360 degree version created by Andrew Bodrov shortly after. A Chinese rover and lander have taken images of each other on the Moon's surface. China in turn shared the time and coordinates of Chang'e 4's scheduled landing, Wu told reporters during a briefing on the lunar mission. He added that while NASA's satellite did not catch the precise moment of landing, it took photographs of the area afterward. The lunar mission by Chang'e 4 and its rover, Jade Rabbit 2, was a triumph for China's growing space program, which has been rapidly catching up with those of Russia and the U.S. President Xi Jinping has placed space exploration among the country's national development priorities and the far side mission offered a chance for China to do something not done before by any other country. The far side of the moon — the side which faces away from Earth — posed a challenge for scientists because it is beyond radio signals' reach. China set up a relay satellite in May to receive communication from Chang'e 4. "In the past, we were always rushing to catch up to the advanced global standards"in space, said Wu Weiren, the chief designer of China's lunar exploration project.